England continue impressioning the girl with a lock in her forehead. Their only small loss in the past 3 years was by 4 wickets to Pakistan; at Dubai they were again thrashed, saving themselves from an innings defeat only thanks to Swann and Anderson's late hitting. At some level we oughtn't be surprised. In the warm-up they lost wickets to loose shots, including several leg-side nicks. Against a better batting lineup than the associates their accurate bowling kept them in the game for longer than most teams might have, but on a pitch with few dramas, no team can win with only 352 runs on the board across two innings. Their nemesis, Saeed Ajmal (10/97) continues his excellent form from last year. There wasn't serious spin on offer but his flight and England's rubbish shot selection were sufficient. With the bat, Pakistan were patient, as expected, with Mohammad Hafeez and Taufeeq Umar providing an under-rated stable opening partnership; and Adnan Akmal (61) shepherding the tail brilliantly to turn a strong position into a dominant one. His keeping was also top quality, taking four catches in the second innings. A big improvement on his brother. England have made a habit of bouncing back from losses, and they aren't rated as highly as they are for nothing. The best Pakistani sides have always married grit to their natural flair, and for all the criticisms of Misbah ul Haq's conservatism, this one is no different. In conditions that favour them, it will take a performance England has shown no sign of producing on tour to date to turn win the final two games of the series. Another series with two teams whose ratings are probably inaccurate given their circumstances. Zimbabwe's long lay-off means their rating is provisional, although their few tests back are indicative that they are not too far wrong. New Zealand's win in Australia was a big boost for a side that had been going backwards for most of the past two years, and their youthful side might be due a resurgence. Conversely, the first leg between these two sides produced a minor classic, so the 211 run expected margin looks generous. At home, New Zealand ought to win comfortably. Their batting will need to adjust after several months of T20, but there are no terrors in the Zimbabwe bowling lineup, and few obstacles in their batting. In the sort of test that would be very interesting in a championship, but is a fairly meaningless run-out with none, any sort of contest will be welcome. Yay for Indian incompetence. Having already previewed the England-Pakistan series on the basis that it overlapped with the Perth test, the short test means I can put it here with the Adelaide preview instead. It seems hard to believe that 3 1/2 years ago Dhoni was being lauded by commentators for his aggressive fields and batting, in contrast to the passive Kumble who let tests drift to draws with Indian ascendant. Now, apparently, it is Kumble's fight that is needed to pick India up. Dhoni's passivity in Melbourne and Sydney surely cost them when opportunities to attack presented themselves. the Indian captain can counter that with the undeniable truth that a captain cannot attack with runs leaking to all parts of the ground. The bowlers, similarly, will argue that the fieldsmen cost them more runs than their Australian counterparts. Australia's batting remains far from strong though, and outside Sydney, India's bowlers have performed well enough. Unlike in England where they were beset by injuries they could call on quality players. Yet they let certain sessions either drift, or be taken away from them. Yadav has plenty of potential, but leaks too many runs, Zaheer needs support from the other end, Ishant a reminder that he hasn't achieved anything of note. Last season, England's gaps in wicket-taking were filled with dry lines and sustained pressure that kept them on top until something happened. In Perth, India chose the worst possible batsman to feed several poor balls an over. Warner's innings was attacking without being foolish, as evidenced by Cowan scoring at nearly a run-a-ball as well. It was incredible hitting, and it effectively finished the game after Australia's earlier dominance with the ball. Without the 150 gifted runs of that session, Australia would have faced a trying 3rd day chase, not won with an innings and some to spare. Australia might well be asked why they persisted with Johnson for so long. Without his erratic lines the others have looked capable or better in every test. With Cummins, Pattinson and Lyon outside the XI, and the promise of Faulkner and others, it seems unlikely a place can be found for an enigmatic bowler who manages to put it together only one game per season. A final word on India's batting, which has let them down badly, starting with the openers, and only kept from total collapse by Tendulkar, Dravid (still well below their best) and in Perth, a fortunate Kohli. Kohli made a comment to the effect that they were unlucky coming in and out of sessions. He is right, except the bit about luck. In the 5 overs at the start or end of a session India lost 13/126 in Perth; in the rest of the session, 7/205. Australia, by contrast, made 119/3 and 250/7. It is a statistic that speaks of a lack of either fitness, concentration or effort; and a problem Australia has ruthlessly exploited. Those wickets late in the session did more to hurt India than any single factor in Perth; the heat no doubt takes some blame, as it saps enery and concentration, but players can train for that, and that ultimately, is where India's trouble stem from. Unlike England last summer, they weren't prepared to face the unique tests Australia poses, and they've come up well short. The series moves to Adelaide with India ranked fifth; such is their fall, that they will need a decent performance to stay above Sri Lanka. A difficult to predict series, with both teams on runs of form that might be luck, but might be indicative that their rating is well under. Although this game is being played on neutral territory, the UAE is expected to suit Pakistan more than England, although (unsurprisingly) the latter have had the more professional build-up. The ICC XI game was an interesting one, slightly contrived to get a result, but far closer to expected - ratings-wise, if England is the baseline, the ICC XI played at the same level as South Africa. England's batting struggled badly in that game, mostly due to uncharacteristically loose shots, although they chased down 261 to win, they'll have to play better against Pakistan, who've recently shown the patience to compile big scores and the skill to defend them. England's bowling attack has been subject to much speculation, between those who'd prop for Panesar as second spinner, Tremlett or Finn who'll struggle to find the bounce and pace they like, and Onions, back from injury and something of an unknown. Or five bowlers, generally disliked by anyong sensible enough to realise that if you need five bowlers (100+ overs), you almost certainly need an extra batsman too. Not enough tests have been played on the ground for me to guess at what they ought to do; those that have been played here have often been boring draws, and neither batting lineup is likely to collapse and gift victory if that is the case. If a team does gift victory, it will probably be Pakistan, whose recent strong record is predicated on playing weak teams, and might become very bogged down against a tighter bowling lineup, or be found out as completely ineffective against circumspect batting. If England play anything like their form in the past 12 months they will win comfortably. Pakistan are perfectly capable of achieving the other three results as well. Pattinson, Cummins, Harris, Johnson, Watson. It is hard to say if that would be Australia's first choice bowling lineup because for most of the past two years the choice has been so limited as to be irrelevant. What is clear, is that there is a problem with injuries to fast bowlers that afflicts world cricket. Numerous articles have been written about workload, arguing that modern bowlers have more or less than their predecessors, and ought to therefore have more or less work today. I don't want to go into those, except to note that, by and large, injuries have always been a problem in cricket - we merely tend to forget players crippled early in their careers - and that they are far more severe problem for a professional cricketer than an amateur one. What I would like to do is make a comparison with the closest sporting equivalent to a fast bowler: a baseball pitcher. Despite closer management and more focused training, professional baseball has also seen a gradual increase in the number of injuries, however they have also seen an increase in career length. The latter is almost certainly more important. A pitcher will be cut for weak performance or career ending injuries, with the former often being a function of the former. The longer the average career, the less impact those injuries are having, even if the total number of injuries remains constant. There is a lot written about proper pitcher management, because it matters a lot to multi-million dollar baseball players and the franchises that purchase their labour. Except in particular circumstances pitchers follow a strict program of rest and recovery, mindful that (according to this article) the highest skeletal muscle stress levels occur 2-4 days after significant effort. A finding supported by this study that there is an optimum bowling load of neither too many, nor too few overs, and of breaks neither too short nor too long; and this study that shows a massive risk ratio increase of 1.94 for fast bowlers in the second innings. A starting pitcher therefore operates on a strict schedule. Lincecum, a pitcher San Francisco would use every day if they could, has a pitch count by day of the season (excluding spring training) that ticks like clockwork. Cricket's problem with injuries almost certainly stems in part from doing the opposite. 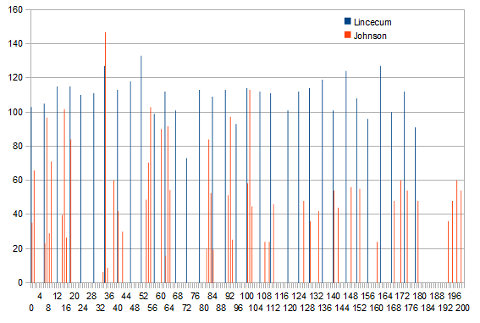 During the first class season (the first half of the year) Mitchell Johnson's total workload is lower, but his day by day ball count shows clumps of peak activity, with no chance of minor stress recovery, followed by two (or more when rested) weeks of inactivity that can only serve to lower conditioning. Cricket Australia have claimed in the last two days that Pattinson would have been rested for Perth as, by the end of the Sydney test, he was exceeding the workload needed to avoid injury. Too little, too late to rest a player for two weeks after pushing 450 balls out of him in 11 days. A pitcher would never exceed 360 pitches in that space of time. The only way to manage a player sufficiently closely to prevent that sort of overload is to have no back-to-back tests (a nightmare for schedulers, but common in the distant past) or to give teams the right to substitute players. The danger with substitutes is that they can give an unfair advantage to one team if they are unconstrained. In other sports - and cricket is unique amongst major sports in not permitting substitutes - both offence and defence must be maintained as the game switched regularly between disciplines. Cricket does not, however, having only three changes, and only one where both have been played, and will be played. The ICC's ill-thought-out ODI substitute rule in 2005 floundered on this problem, acting more like a "designated hitter" rule than substitute, helping the team batting second with no benefit for the team batting first. If implemented in first class cricket, a substitute rule would need to be resticted to between the second and third innings, maintaining parity between disciplinary needs (although teams ought to be free to lessen one in favour of the other). Weirdly, we don't have to look far to see a successful implementation. In the ICC XI vs England game, Hamid Hassan's untimely collision with the long-on fence saw George Dockrell replace him for the second innings. It was a seamless transition. The ICC XI always had 11 batsmen, 11 fieldsmen, and five bowlers. They gain, slightly, for introducing a spinner and stronger batsman for the second innings, but only tactically, not structurally. Statistical records, measured in runs and wickets per innings, not by the game, are almost unaffected by the change. Tradition will make people oopposed to change, but the no-substitute rule operated for 70+ years in football before it was changed, and now it is hard to imagine the game without it. Traditions change. Done properly, noone really cares. Aesthetically, a substitute rule would add, not detract from the sport. It allows scope for tactical change, the introduction of a spinner for a paceman, a more aggressive batsman for a plodder, a bowling all-rounder for a batsman; making the game richer. It prevents a team being heavily disadvantaged by early injury, although some disadvantage is still inevitable, while they wait for the change. As much as we admire Cowdrey, Marshall, or McCosker, playing injured is also stupid, and can do more damage. The tactical scope would allow aspects of the game to reverse their decline such as out and out pacemen or spinners working in tandem. Similarly, any improvement to bowling quality helps redress the current dominance of batsmen, as well as improving the standard of cricket being watched. Players currently unable to handle the physical strain of test cricket could have had longer careers bowling half-games. A short-list of players in this category would include Malinga, Bond and Flintoff, all crowd pullers sadly missed. In theory, allowing players to rest while the game continues would also reduce the need for week-long breaks, allowing the scheduling of back-to-back-to-back games. But mostly, it is about keeping players on the field, where they ought to be. If Pattinson and Cummins had been able to share the load while they matured, both would probably have turned out in Perth this week. Similarly, Harris is unlikely to have a fruitful career through his mid-30s, being maybe one injury from ending it completely. Being able to play half a game at a time woulg significantly reduce the probability of that injury happening. After highlighting their lack of big scores a week ago, South Africa went really big in the third test. 224 for Kallis, 160 not out for de Villiers and a ton for Petersen left them racing only the clock to get the win. With Philander back that was no problem, taking 3 wickets in both innings, Tahir picked up 2 and 3 with only Samaraweera offering serious resistance. South Africa has had inconsistent form throughout the summer, partly because of the form of Smith and Morkel, who barely contributed throughout, putting pressure on their team-mates. Sri Lanka have that problem, but moreso. Samaraweera wasn't supposed to tour but top-scored, Sangakarra keeps on, and Herath and Welegadara bowled well in parts, but otherwise only he gradually developing Mathews produced. Like several other teams, they need to regenerate after a long period of stability and the recent retirement of key players. Ultimately, a 2-1 loss is actually a positive result for a team that hadn't looked like winning anything since Muralitharan retired. Fortunately for them, the consequences of repeated failure at test level aren't severe. Teams are allowed poor games, and heavy losses. Even England lost badly in Australia last year. With each heavy loss though, the probability that India are actually an average side, and not a good side having a bad run becomes higher. Tendulkar and Ashwin aside, none fo the batsmen looked like making heavy runs on a pitch that Australia showed had no demons. Making 400 was a decent effort, but Australia was confident of victory having dominated for the first three days. The only hiccup, was the early loss of the inexperienced top-3. After a period of consolidation India barely looked like getting a wicket, with only a loose shot by Ponting providing them one for the next two days. Clarke's innings rightly got the plaudits, but Ponting's was the more interesting. Two years since his previous ton, he slowed considerably as the day wore on, indicating that maintaining concentration across a full day is still difficult. While he has made several 50s in recent times, he is yet to score big across a whole day (this innings being split from the 47 not out overnight), not for lack of fitness, certainly, but struggling to become set and comfortable. His experience and fight allow him to remain competitive, but the big runs are surely gone. His retirement awaits only the settling in of a proper replacement. Samir Chopra wrote two pieces on playing cricket socially last month. In one, he rallied for the plight of specialist fielders: players who neither bowl, bat nor keep sufficiently well to justify giving them a chance if you want to win, but whose playing enjoyment is diminished unless they really like fielding. I do love fielding, I'm a poor to moddling batsman, and a decent bowler who is fit, fast and likes diving around. I've even been a specialist fieldsman and enjoyed it. But he has a good point; team cricket is a brutal game for weak player; a game where a poor batsman might spend hours sitting and watching, a poor bowler receives no chance to participate at all. As Samir notes, compared to basketball, cricket is just not as fun to play. Except, at least in Australia (and NZ), noone plays pick-up cricket as a team sport. Occasionally, yes, but mostly not; at school lunch-time, BBQs, and backyards, whether 2 people or 30, Australians generally play backyard cricket. The rules of backyard cricket might seem random, but most achieve two aims: to equalise abilities and increase participation. Without teams, everyone can rotate through the bowling - including single ball overs with large numbers of fieldsmen. With the bat, one-hand-one-bounce and tip-and-run significantly increase the probability of a batsman being dismissed; whether being replaced by the fieldsman or merely rotated. Conversely, no-out-first-ball, allows a weak player to face at least two balls, though we used to limit the rule to girls. Social cricket is fast-paced, and partipatory, players get multiple opportunities to perform. If my only introduction to cricket had been formal team cricket, I'd probably never have played, but because the bulk of the cricket I played growing up was social, I developed (a few) of the necessary skills in a setting that allowed it. This is not a new idea. Although it is worth restating. A couple of years ago, there was a wide-ranging discussion on Peter della Penna's blog on the development of cricket in America, where a commentator stated that cricket would be boring for children with all the waiting. It is, but only in a formal setting; cricket's looser rule structure and multiple formats permit a social version of the game that is inclusive. Hence, kanga cricket and other junior programs encourage participation over scoring. Unfortunately, those programs are for small children. Adjustments to cricket to make it more social haven't percolated through to adult formal cricket. Cricket teams always face the same logistical problems in organising a game: the need for 11 players, not 12, not 10, and the concomitant need for an address book of casual ringers, or junior teams who can fill in; the need for an opposition, and the accompanying travel and its arrangement; the need for a relatively evenly skilled base of players on each side, lest the game be one sided, or the problems described above develop. In developing nations, or the country areas in Australia, or even specific competitions (like women's cricket), the sparsity of available players makes organising a team a significant problem. A sense of it can be seen when reading about the problems at youth level in Dutch Cricket; the most successful nation in continental Europe has less than 200 players at each age level, travelling all over the (small) nation just to get a game. It requires just 8 players to form a team, sometimes only 6, and being "short" is only a mild impediment because players can bat twice if required. It is a shorter game, taking only an hour or so to play. It equalises abilities and encourages participation: every player must bowl, batsmen continue to bat after being dismissed (albeit with a run penalty), the nets allow a poor batsman to succeed by prod dingthe ball into the side and running. Although a strong fieldsman can demonstrate brilliance, weak fieldsmen are easily hidden; the ball going through your legs is no great problem. During the 1992 World Cup my local indoor cricket centre attempted to start a junior competition, and sort-of failed. It never attracted enough players to form two teams, with only 6 to 10 players. To make do, we played what might be termed "pairs cricket". Each pair batted against the other 4-8 players and had their plus score tallied, and their bowling scores negated. There was no bonus for catches or runouts, although there probably ought to have been. At the end of the game, the winner was the pair with the best record. The advantages of a similar game format (played either indoors or out) for development ought to be obvious. Instead of needing to create a team, and find opposition, players can just "turn-up", significantly lowering the commitment hurdle, and allowing reluctant but interested players to have a go. The format would work with anything from 8 to 16 players, although with more a second game would need to be played, or teams formed. By playing in pairs some equalisation of abilities is possible in selection; the dismissal as a 5 (or 10) run penalty keeps people in the game for a set period. Good bowling - taking wickets - and good fielding (if runs were awarded for catches) is as valuable as scoring runs with the bat, meaning there is no bias against disciplines. The game would be relatively short - a 12 player (6 pair) game with each pair facing 5 overs (1 from each pair) would take 2 hours. Having pairs would allow "promotional" competitions between players that would suffer huge losses in team cricket: examples might be father-son competitions - something Jamie Harrison hints at the need for in this podcast - or first-class/international pairings in developing nations or an "all-star" weekend, where a whole competition could be played over a few days. Often the plurality of cricket's formats is seen as a weakness, but for development it is a strength. It allows us to create a form of cricket that isolates the core of cricket - a batsman facing a bowler - and produce a competition that can be participatory, evenly contested and less constrained by logistical issues caused by having a sparse network of players. Something team cricket can, unfortunately, often not achieve, particularly in markets where there just aren't enough players to have more than one team in a city. Pairs cricket is proposed here, as an idea worth pursuing. A belated review, owing to not posting much of anything the past few months. An excellent tournament with a large number of close games, a thrilling finish to the group stage in group B, and an excellent final. I saw most of Nepal's matches - streamed from Nepalese TV - including their thrilling, if fortunate, win against Kuwait (a 1 run win, but off a ball that was either a leg-side wide or the best stumping I've ever seen), their thrashing at the hands of Afghanistan in the semi-final, and their thrilling, if fortunate victory over Hong Kong when Irfan Ahmed had a melt down in the last over. The big surprise was the failure of UAE to progress through to the semi-finals, and the WT20 qualifiers. They'll unfortunately now host them without participating. Upset by Hong Kong, their quest to qualify on NR/R was stymied by an incredible innings by Hammad Saeed, scoring 63 (of 115) off 38 balls to scrape easy-beat Saudi Arabia past the target needed for Nepal to qualify in their place. Oman scraped into second place in group A with a 3 wicket win over Malaysia that I wish I'd seen: 29 runs came off the last 2 overs, including a last ball boundary when 3 was still required. In the semi-final they were close, but Munir Dar (74 off 46) and Irfan Ahmed 3/20 (4) and 23 (10) - one of the real stars of the tournament - got Hong Kong home in the last over. In the final Hong Kong looked like competing a huge upset, needing only a run a ball off the last 5 overs with 6 wickets in hand. But Dawlat Zadran 2/21 (4), Hamid Hassan 3/12 (4) and some poor running left them eight short. The regional qualifiers now concluded, the wait now begins for the World T20 qualifiers scheduled for March 13-24th. The format for this tournament is both insanely packed, and confusing. In short, there are two groups of 8, each team plays group games on the 13,14,15,16,18,19 and 20th, followed by a day of rest. * The winner of each group will play a preliminary final for the first final place; the second and third placed teams will play (across groups) elimination finals, for the right to play the winner of the elimination finals in another elimination final; the winner of which will play the loser of the preliminary final in a qualification final, for the second final place. With only two places on offer this is relatively fair, as it puts the onus on group places, rather than the crap-shoot of lengthy play-offs. But it means winning the group is essential (a 75% chance of qualifying vs. just 12.5% for second and third place). I'll preview the groups closer to the event. It looks like group A might be slightly easier overall, but it is much of a muchness in the top-3, and any team will need to overcome one of Afghanistan or Ireland to make their way to Sri Lanka. In other news, England is to play a combined Associate/Affiliate XI as part of their warm-ups for playing Pakistan in the UAE. I have my misgivings about the idea, as in the long-term it might undermine the push for associates to play test cricket, and devalue the I-Cup if they are subsumed by a combined team that plays regularly. But as a one-off it is something to look forward to. The side is composed of Irish, Scottish, Afghani and Namibian players, meaning it could be stronger, but is still a quality outfit, capable of matching most test sides in the bowling - though England will probably dominate them, and the batting looks weak. In a positive sign for associate cricket, the game will be streamed online by QuipuTV. Hopefully this will be carried forward and streams of all the top-tier of associates will occur, including (particularly) the World T20 qualifiers in March. The price is quite steep for three days ($9.99 USD), but they need to cover costs and create demand. Supporters of associate cricket might see this as a useful donation for raising the profile of the game world-wide. Frankly, the ICC is insane and short-sighted not to subsidise the stream out of their own pocket. But I'll take what I can get.